The Excalibur has BIG drying space. 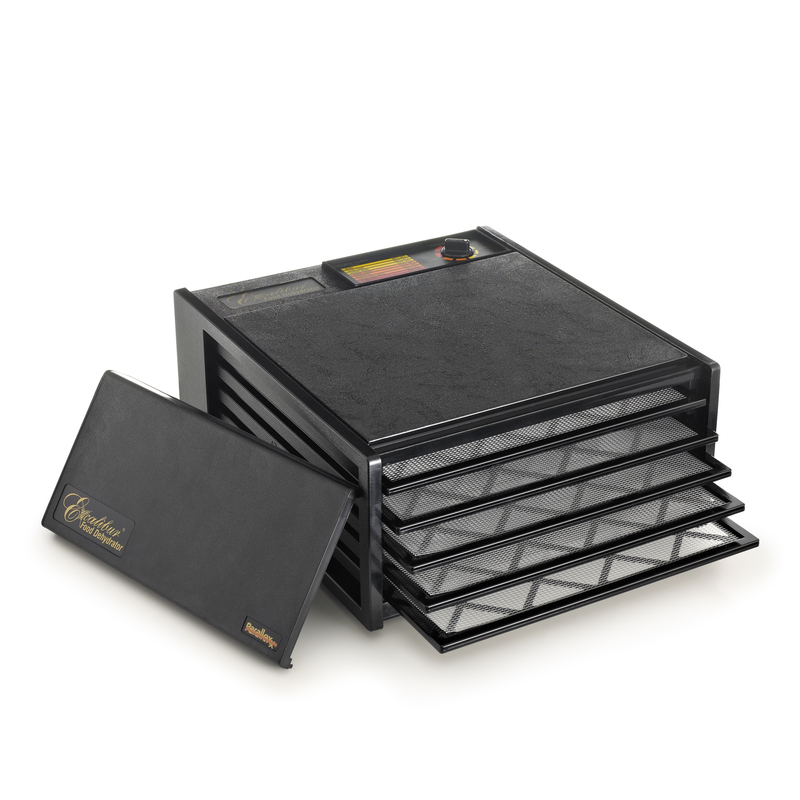 The Parallexx™ drying system dries trays evenly. Electronics are back-mounted so spills won’t bake on. The adjustable Hyperwave™ thermostat dries with precision. Removable dishwasher-safe trays are easy to load; leave some out for big items. Our polycarbonate machine is virtually indestructible. It doesn’t give off harmful fumes like low-quality styrene dehydrators. Our polycarbonate is a natural heat insulator, better for homeowner dehydrators than single-wall stainless steel. Trays won’t crack or break. 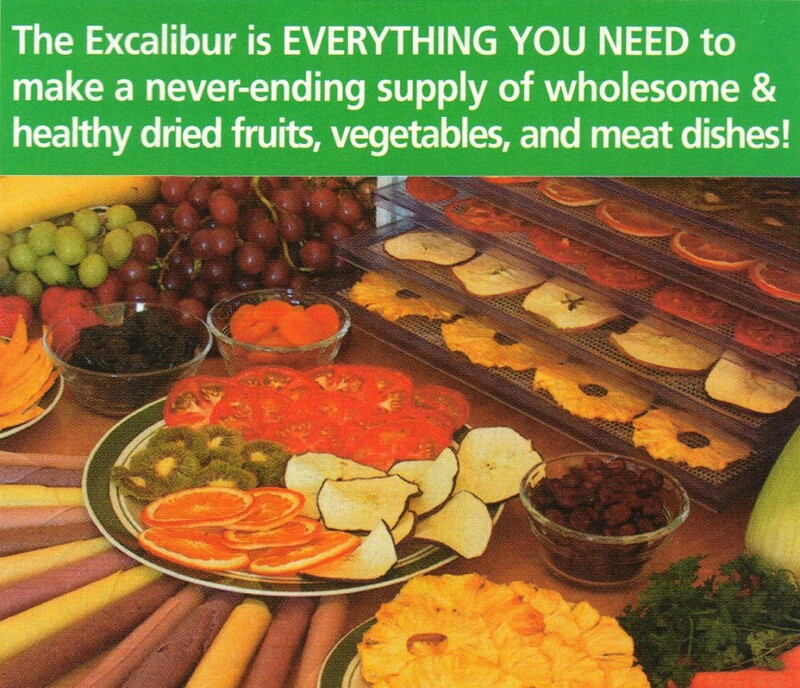 With the adjustable Hyperwave™ thermostat, timer, and removable trays, anybody can dry just about anything in an Excalibur – big or little items, liquids, solids, fruits, vegetables, meats, craft projects, and more. It’s the perfect choice for those interested in gardening, hunting, fishing, outdoor sports, crafts, health, nutrition, special dietary needs, raw & living foods and more. Even the smallest Excalibur has lots of drying space, so you handle large volumes up to 10 times faster than others. It’s inexpensive to run using just 4-5 cents of electricity an hour. It gives outstanding performance: The ONLY dehydrator that dries foods enough to be powdered. It’s the top choice of homeowners, small businesses, universities, and fine restaurants worldwide. Great for small gardens or specialty gardens. Adjustable Thermostat 105◦F to 165◦F: Temperature range is low enough to preserve active enzymes in fruits and vegetables. Temperature range is also high enough to meet safety standards for dehydrating meat for jerky. Unit turns on automatically when thermostat is in use. Take a closer look at the 4 key engineering features that make the Excalibur uniquely different & better than other dehydrators. Commercial features throughout, derived from our commercial dehydrators. 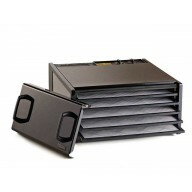 Large-capacity, square box design gives maximum drying space and efficiency. Back-mounted fan, heating element, controls remain spill-free. 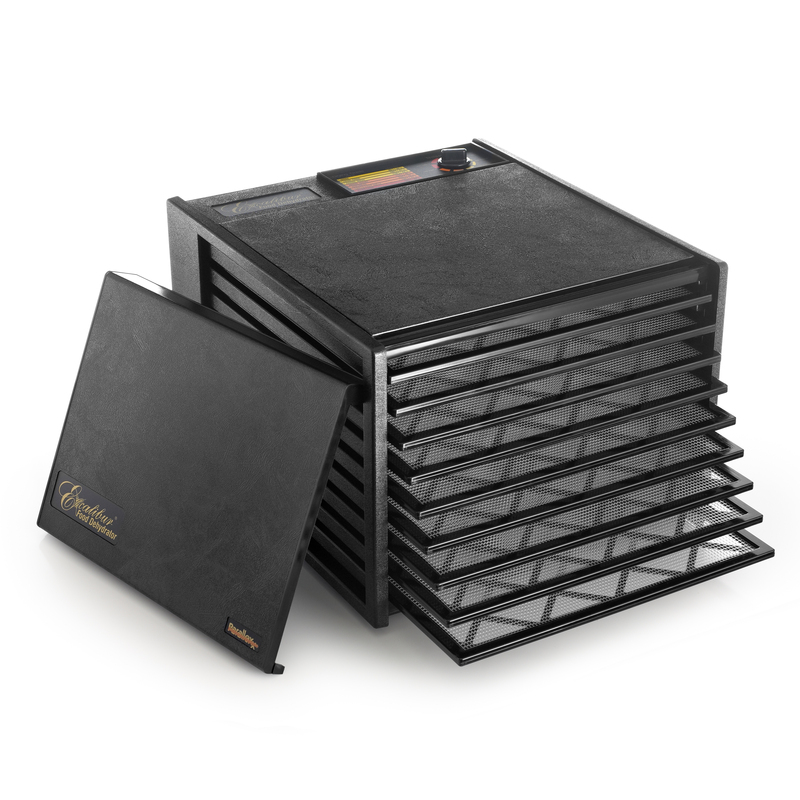 Parallexx™ drying system heats and dries all trays evenly. Adjustable Hyperwave™ thermostat fine-tunes the heat so you don’t over/under dry. Timer (optional) lets you “set it and forget it” while you’re sleeping, at work, etc. Removable trays slide in and out easily for convenient loading, unloading. Easy to clean with a damp cloth. Trays are dishwasher-safe. Easy-access door simply lifts off. Looks great in any kitchen. Built to handle ultra-heavy use: 24 hours a day, 7 days a week, years on end. Polycarbonate materials (same as jet plane windshields!) are virtually indestructible. 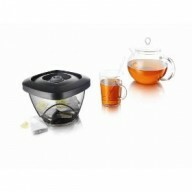 Highly heat resistant, remains cool to the touch, doesn’t give off harmful fumes. Superior to single-wall stainless steel dehydrators made for homeowners – they get hot and dent easily. Trays are rigid and extremely durable for long life – far superior to metal oven racks! Flexible polyscreen inserts (optional) lift out for easy food removal and easy cleaning – other dehydrators don’t have them! Excalibur Premium Paraflexx™ sheets (optional) are top-quality, 100% non-stick, ideal for sticky or liquid-y foods, safe up to 500°F for baking. Dries virtually anything that you’d ever want to dry: dried fruits, vegetables, soups, stews, beef jerky, fruit rolls, yogurt, crafts, dry flower bouquets, drough & clay art, much more. Fine-tune, adjustable thermostat lets you choose the exact temperature you need. Removable trays let you customize drying space for small or large items – e.g. yogurt by the quart (impossible in a stackable dehydrator). Expanded versatility with “super” non-stick Paraflexx™ sheets: handle sticky or liquid-y foods. 10-times faster tha others with our high-efficiency Parallexx™ Horizontal Airflow Drying System. Holds up to TWICE the food per load than common round dehydrators. Just 4 to 5 cents of electricity an hour to operate – dry a full load for less than 25 cents. High-tech drying utilizing Hyperwave™ fluctuation*. Laboratory testing proves performance superiority: faster, more efficient than others, better food quality, color, and taste. 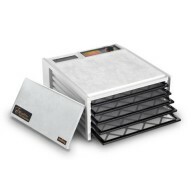 ONLY dehydrator that dries food dries enough to powder (for baby foods, etc.). 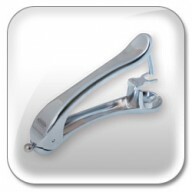 Used daily in small commercial businesses, universities, restaurants world-wide. For 33 years, we’ve constantly expanded our knowledge of the mechanics of dehydration including airflow, heating dynamics, materials, and much more. 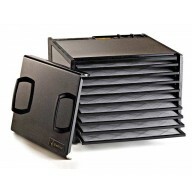 Any dehydrator will dry food. Excalibur dries better, faster, and safer thanks to our Hyperwave™ Fluctuation Technology! Ordinary dehydrators produce constant, unchanging heat causing “case hardening”, a dry surface with moisture trapped inside – a perfect environment for yeast, mold, and bacteria growth. Excalibur’s adjustable thermostat lets you take advantage of Hyperwave Fluctuation (changing heat through the drying cycle) for faster, better safer dried foods. As the temperature fluctuates up the surface moisture evaporates. Them as the temperature fluctuates down the inner moisture moves to the drier surface. The food temperature stays LOW enough to keep the enzymes active, and the air temperature gets high enough to dry food fast, overcoming yeast, mold, and bacteria growth and spoilage. I DON’T CARE ABOUT ENGINEERING FEATURES. GIVE ME THE BOTTOM LINE. You’ll save money on food bills when you buy & dry foods in bulk. You’ll preserve & savor every fruit & garden vegetable you grow. You’ll preserve fish & meats FAST – just 4 hours. You’ll dry more easily, less expensively than canning or freezing. You’ll eliminate preservatives & additives in the food you eat. You’ll give your kids (yourself, too) healthy alternatives to junk food. You’ll dehydrate a full load of food just just 25 Cents worth of electricity. You’ll dry home crafts, flowers, dough creations. You’ll make it pay for itself in no time. You’ll savor luxuries on a shoestring: commercial sun-dried tomatoes @ $20/lb. vs. pennies/lb. when you dry your own tomatoes. You’ll slash your food storage space – no pantry, no freezer necessary. You’ll have a stash of high-energy, healthy foods ready to go hiking, jogging, etc. You’ll provide high nourishment for those with special dietary needs. You’ll make your own healthy baby food for pennies. You’ll try it yourself for 30 days and get your money back if not satisfied. 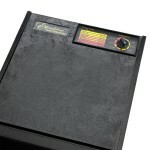 Be the first to review “5 Tray Excalibur Food Dehydrator 3500” Click here to cancel reply.